Most sites are found because of a search engine, which means investment in search engine optimization is vital, even for e-commerce. We approach your site optimization from different angles so that you maximize your reach and your relevance. It isn’t just about throwing money at Google; it’s about connecting with your customers in authentic ways even before they land on your website. Read more about how we do SEO right. E-commerce websites may have a hard time competing for search terms that are dominated by the huge players in their field. That doesn’t mean they can’t be on the first page for highly focused keywords or phrases. 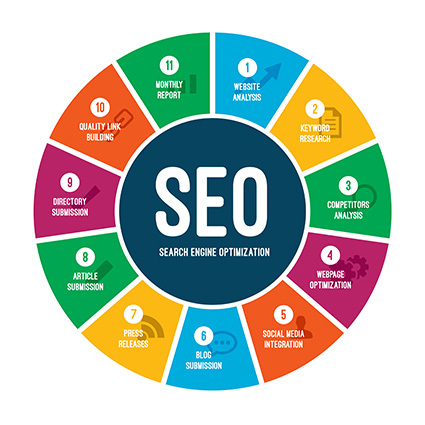 Search Engine Optimization is about helping your organic traffic. This is positioning that you do not pay Google for. Okay, we’ve optimized your site and you’re ready to turn on your Pay-Per-Click (PPC) campaigns to drive enrollment and development. During PPC Optimization, we check all of your ads on a weekly basis to see which ads are working the best, and to improve those that could get better results. Rankings are great, but they don’t translate into increases in sales or leads. Conversion Rate Optimization increases the number of leads captured. We create landing pages, eBooks, blogs, and other content to build your marketing database. We believe in honesty and transparency. We won’t tell you what you want to hear just to get you to sign a contract, and we won’t sign on to do work that we don’t believe will pay off for you. You may not rank highest for the most competitive keywords, but we will find the SEO-corner that you can dominate. We will also send you reports that are both detailed and simple to understand, letting you know what’s working well, what’s not working so well, and what we’re going to do to make it better. You need to know your budget. SEO is not fast, and it is not cheap. It’s a long-term investment that consistently helps you extend your reach. Returns are determined by how much you’re able and willing to invest. If you aren’t entirely sure what your budget should be, we can help you work it out. Many clients come to us who have been burned by SEO agencies in the past. We’ve had some clients who had spent thousands of dollars and hadn’t heard from their team in months. That doesn’t happen here. You’ll hear from us often, and always know what’s going on with your campaigns and where your money is going. If you have any additional questions or concerns, your dedicated campaign and project managers are always within reach. This one is almost impossible to answer without some detailed research. It depends on a few things: where you are today, and where you want to go. A few tweaks to your website will not get you on page 1 of Google tomorrow. Good SEO takes time. But our starter packages are structured to allow time to lay a solid foundation early in order to steadily build to real results within 7-12 months. Want results faster? We need a bigger budget to make more progress each month. Can we start small and build once we see some results? This approach just doesn’t work. For this reason, we can’t take on projects with too little a budget. The reason is pretty simple: Tiny budgets see tiny results, you won’t be happy with those results, and we aren’t happy when our clients are unhappy. If you’re not ready to really invest in the growth that SEO can bring right now, then we’re probably not the right team for you. You don’t have to be an SEO expert in order to work with us, but we do rely on our clients to be involved. We need your expertise, along with all the knowledge about your customers and your business. We will handle everything else, but if you can’t devote the time to work with us when it’s needed, we cannot be successful as a team. As with most investments, you should determine your budget based on what you expect to get out of it. Once you have determined what each new customer who finds you through your website is worth, the overall value of SEO becomes more clear. Actually, we highly recommend investing in both PPC and SEO at the same time. In some instances, we even recommend starting with PPC first, especially if you don’t have the right analytics in place to fully understand which keywords are driving revenue for your business. In those cases, PPC is a kind of laboratory where we can quickly conduct cost-effective research that helps us determine how to best optimize your site. How will I know if it's working? We’re obsessed with metrics and reporting, and look at all the numbers on a regular basis. Most importantly, we craft all this data into easy-to-understand monthly reports so that you can see how your money is performing. View a sample report. © 2011-2018 Bluehive Interactive. All rights reserved.